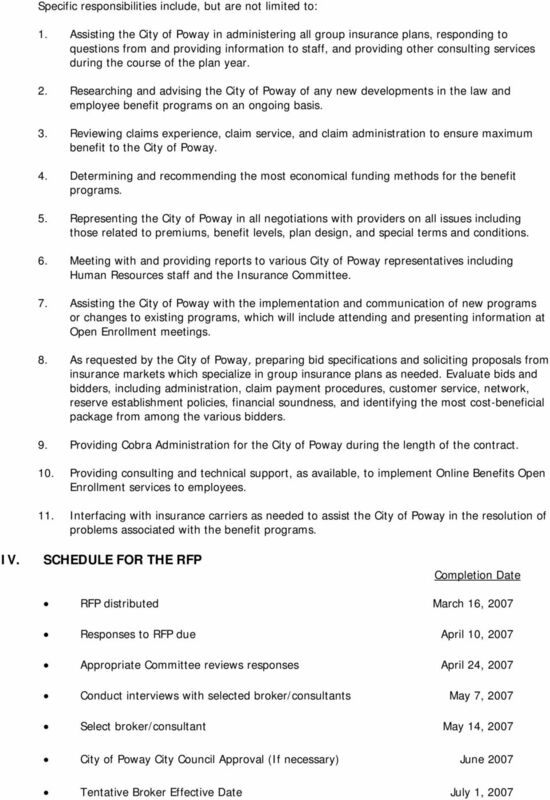 Download "REQUEST FOR PROPOSAL FOR EMPLOYEE BENEFIT BROKERAGE CONSULTING SERVICES City of Poway"
1 REQUEST FOR PROPOSAL FOR EMPLOYEE BENEFIT BROKERAGE CONSULTING SERVICES City of Poway I. INVITATION The City of Poway is interested in obtaining the services of a professional, highly qualified benefits brokerage and consulting firm to provide a full range of services related to the design, implementation, analysis, maintenance, improvement, and communication of an employee insurance benefits program. Interested and qualified brokers/consultants who have demonstrated their ability at comparable work are invited to submit proposals. Proposals will be accepted until 5:00 P.M. on Tuesday, April 10, Submittals and requests for information relative to this Request for Proposal should be addressed to: Richard E. Dukellis Human Resources Manager City of Poway Civic Center Drive Poway, CA Written responses and all supporting materials must be submitted in one original plus five copies. Please note that the City of Poway is not asking for, nor authorizing, your soliciting quotes from insurance carriers. II. BACKGROUND OF THE CITY OF POWAY The City of Poway incorporated in 1980 and operates under the City Council-City Manager form of government. The City has approximately 280 benefit eligible employees and currently 15 retirees. The City offers the following benefit options to active benefit eligible employees, and all plans renew with an effective date of December 1 st : Blue Cross Health Insurance (HMO & POS) Kaiser Health Insurance (HMO) Blue Cross Wellpoint Employee Assistance Program (EAP) Standard Dental (PPO) Safeguard Dental (HMO) Vision Service Plan (VSP) Vision Standard Insurance Company Life Insurance (Group & Supplemental) Assurant Long Term Disability (LTD) Insurance Early retirees can elect to continue medical insurance coverage until attaining age 65. III. SCOPE OF SERVICES The City of Poway is seeking a broker/consultant to perform the full range of services related to the design, implementation, maintenance, communication, and improvement of the City of Poway group health, dental, life, LTD and vision insurance programs. 3 V. CONTRACT LENGTH This proposal is for awarding a contract to cover a two (2) year period with options to renew under the same terms and conditions. The first year applicable in the agreement will begin on July 1, The City may, at its option and with the approval of the consultant, extend the period of this agreement up to a maximum of three (3) one-year options, provided the scope of the engagement does not change. The agreement shall automatically renew unless the consultant is notified thirty (30) days prior, in writing by the Human Resources Manager, of the intention to terminate. Termination of the Agreement by the City can occur at any time during the Agreement period and at the City s discretion. VI. SELECTION PROCESS The Contract award will be made after selection of one (1) respondent s proposal from among all respondents with implementation of services to follow. However, this RFP does not indicate a commitment by the City to award a contract to any successful respondent. An award of contract is estimated to occur within approximately sixty (60) calendar days after receipt of proposals. The City intends to evaluate the proposed services based upon the data presented in response to the RFP. The proposals will then be reviewed based on qualifications, specific experience, references, familiarity with the services and pricing, and then rated according to which company best meets the City s requirements. 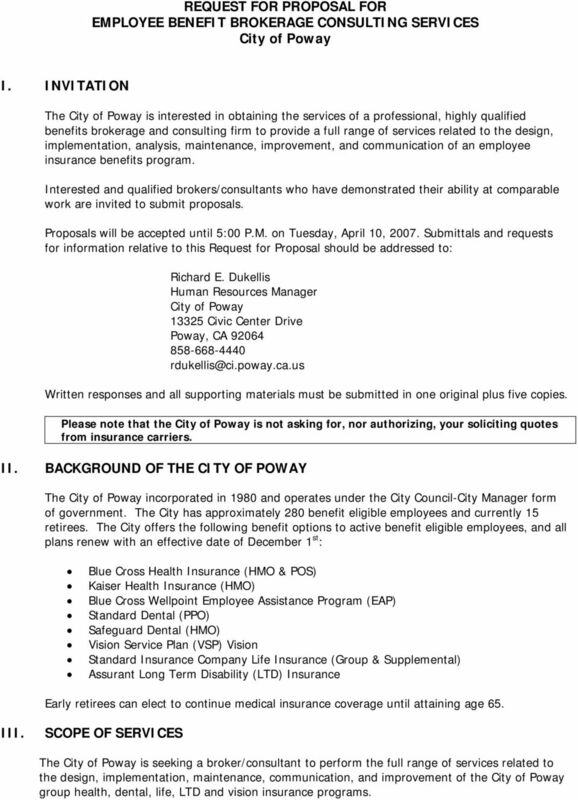 Those firms whose proposals most closely meet the needs of the City of Poway will be required to attend an interview with the City of Poway staff on Monday, May 7, Failure to attend this meeting, if selected, may give cause to have your proposal declared non-responsive, at the City s discretion. VII. 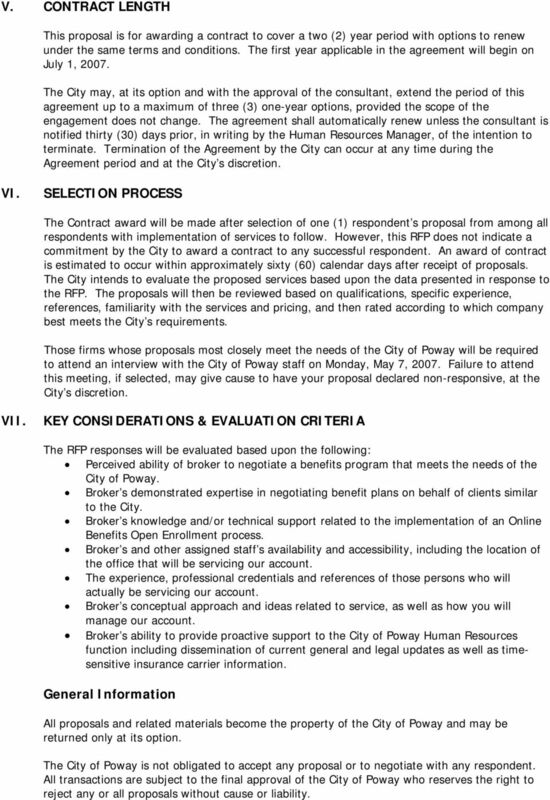 KEY CONSIDERATIONS & EVALUATION CRITERIA The RFP responses will be evaluated based upon the following: Perceived ability of broker to negotiate a benefits program that meets the needs of the City of Poway. Broker s demonstrated expertise in negotiating benefit plans on behalf of clients similar to the City. Broker s knowledge and/or technical support related to the implementation of an Online Benefits Open Enrollment process. Broker s and other assigned staff s availability and accessibility, including the location of the office that will be servicing our account. The experience, professional credentials and references of those persons who will actually be servicing our account. Broker s conceptual approach and ideas related to service, as well as how you will manage our account. Broker s ability to provide proactive support to the City of Poway Human Resources function including dissemination of current general and legal updates as well as timesensitive insurance carrier information. General Information All proposals and related materials become the property of the City of Poway and may be returned only at its option. The City of Poway is not obligated to accept any proposal or to negotiate with any respondent. All transactions are subject to the final approval of the City of Poway who reserves the right to reject any or all proposals without cause or liability. 4 All costs directly or indirectly related to responding to this RFP (including all costs incurred in supplementary documentation, information or presentation) will be borne by the proposer. The selected Insurance Broker will be required to enter into an agreement with the City of Poway utilizing the City of Poway s Standard Agreement for Consultant Services. A copy of the Agreement form is available for review and incorporated herein as Exhibit A. VIII. BROKER/CONSULTANT QUALIFICATIONS To assist in the evaluation of potential brokers/consultants, please provide the following information: 1. Firm name, address, and contact information. 2. Telephone, facsimile, and Internet address. 3. Type of firm: individual, partnership, corporation, subsidiary, or government entity. 4. Organizational structure of the firm, history, including number of years in existence, number and location of offices, total number of employees. 5. Describe the ability of your firm to provide local service to sites/offices located in Poway. 6. Names and titles of all principals/officers of the firm (name, title, phone number). 7. List applicable certifications and licenses and the associated numbers. 8. How many years has your firm been providing health, dental, life and vision benefits services to municipalities? 9. 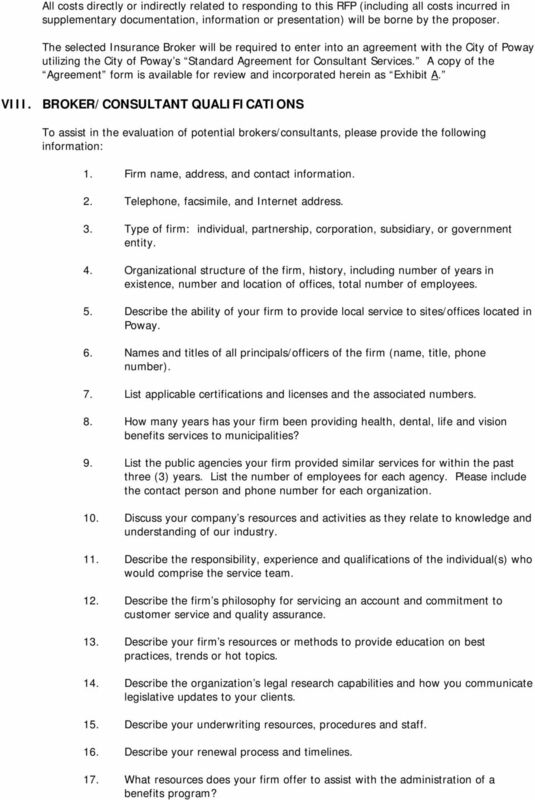 List the public agencies your firm provided similar services for within the past three (3) years. List the number of employees for each agency. Please include the contact person and phone number for each organization. 10. Discuss your company s resources and activities as they relate to knowledge and understanding of our industry. 11. Describe the responsibility, experience and qualifications of the individual(s) who would comprise the service team. 12. Describe the firm s philosophy for servicing an account and commitment to customer service and quality assurance. 13. Describe your firm s resources or methods to provide education on best practices, trends or hot topics. 14. Describe the organization s legal research capabilities and how you communicate legislative updates to your clients. 15. Describe your underwriting resources, procedures and staff. 16. Describe your renewal process and timelines. 17. What resources does your firm offer to assist with the administration of a benefits program? 5 18. Describe your firm s capabilities with regard to communication. Include ongoing employee communication/open enrollment and web based communications. 19. What consulting services and/or technical support does your firm have available to the City of Poway to facilitate the implementation of an online/automated open enrollment process? 20. Describe the firm's Errors and Omissions (E&O limits) and provide evidence your company carries all applicable insurance coverages and licenses. 21. Describe the resources and tools available for benchmarking. 22. Describe the firm s view of the role wellness programs have on controlling healthcare costs. What resources and tools do you offer clients around wellness initiatives? IX. FEE INFORMATION 1) Describe your method of compensation for your services. Discuss how your method of compensation will be transparent and reported to our team. Does your company accept any carrier overrides? If on a commission basis, would your company be taking any form of compensation beyond the commission built into our premium rates? 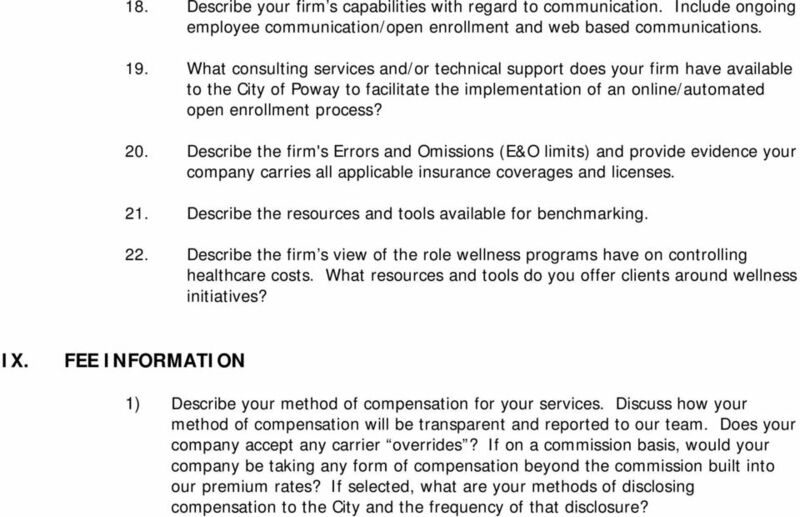 If selected, what are your methods of disclosing compensation to the City and the frequency of that disclosure? B. Present plan enhancement and/or cost reduction strategies whenever possible. C. Enhance plan communication and legal compliance efforts. REQUEST FOR PROPOSAL Employee Benefits Brokerage and Consulting Services SIATech, Inc.
CEDAR CITY REQUEST FOR PROPOSALS Workers Compensation October 2013 Prepared by Cedar City Human Resources CEDAR CITY WORKERS COMPENSTATION REQUEST FOR PROPOSALS 1. Services: Workers Compensation Bid 2. In the event there is the need for Addenda, it will be posted to the RMTA website and an acknowledgement form must be signed. 3. Question: What system is the City of Morristown currently using for benefits administration? REQUEST FOR PROPOSALS COMMERCIAL PROPERTY/CASUALTY INSURANCE BROKER OF RECORD 09/10-10 I. GENERAL INFORMATION 1.1 Issuing Office: This Request for Proposals (RFP) is issued by the Town of Avon, Connecticut. Request for Proposals Community Engagement and Business Development Consultant Contractor Loan Fund May 16, 2016. Solicitation Notice Lee County School System is conducting a search for an independent advisor to assist with the design, implementation, communication and open enrollment of our employee benefits plan. QBE A&H, LLC UNDERWRITING GUIDE OVERVIEW QBE A&H, LLC was created to surpass the needs of Third Party Administrators (TPA's) and broker/consultants specializing in the self-funded employee benefits marketplace.